Thickness of Sheet: 0.47 mm - 1.00 mm TCT upto 12 M in Length. 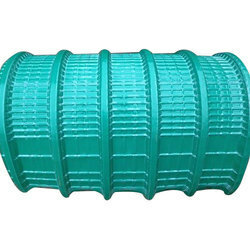 - Available in precoated Galvanised steel with RMP/ SDP/SMP coatings as per IS 14246. - Available in precoated Galvalume steel with RMP/ SDP/SMP coatings as per ASTM standards. - Available in Galvalume steel. Hangars can be easily provided for in DRS metal roofing applications without disturbing the water proof integrity of the roofs for light fixtures, false ceilings, ducts, cable tray etc. With our broad domain experience, we are involved in manufacturing, exporting and supplying a quality range of Curved Roofing Sheet. Our provided sheets are fabricated in accordance with set industry standards and can be availed at very feasible rates by our clients. We are a prominent name in this business, offering excellent quality range of Curved Roof. 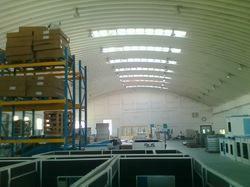 This Curved Roof is highly demanded for commercial and industrial purposes. Our product range is available in variety of sizes and dimensions as per the needs and requirements of our valued clients. We offer a wide range of high quality Curve Roofing Sheet to our clients at market leading prices. The offered range is fabricated using the best quality basic material to meet the international quality standards and is highly appreciated for its long lasting life, graze resistance and wear and tear resistance. - Color Available: Blue, Green, Red etc.